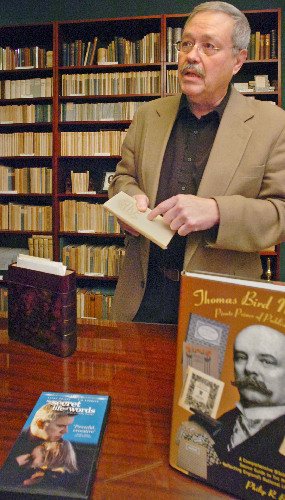 Phil Bishop holds the book used in the movie “the Secret Life of Words.” In the forefront are the DVD and Bishop’s bibliography of Mosher books. EPHRATA, Pa – The way Philip R. Bishop anticipated the American release of the 2005 film “The Secret Life of Words,” you might think him star-struck. In truth, the Ephrata resident is no particular fan of leads Tim Robbins or Sarah Polley, or even Julie Christie, who has a supporting role. For Bishop, the star of the movie is a book that makes a cameo appearance in a tale of illicit love at the heart of a human tragedy. “The Letters of a Portuguese Nun” is a short collection of love letters written in the 17th century by Marianna Alcoforado to the French soldier who abandoned her. The book used in the film happened to be an edition published in 1900 by Mosher Press of Portland, Maine. And Bishop happens to be the world’s foremost collector of books published by Thomas Bird Mosher between 1891 and 1923. He also compiled the 1996 definitive bibliography “Thomas Bird Mosher: Pirate Prince of Publishers” for Oak Knoll Press and The British Library. When Bishop learned the Spanish film company Eldesco Productions planned to use the book in a film, he saw an opportunity to score a unique addition to his collection, which consists of more 181 linear feet of some 2,000 Mosher-related books, including boxed sets, finely bound editions and volumes printed on vellum. He has books from Mosher’s personal library (most with his bookplate), letters to and from Mosher, poetry written in Mosher’s own hand, and even Mosher’s desk calendars. Accompanying it was an authenticating letter written by the producer on film company letterhead. And just recently the long-awaited film arrived on DVD. After viewing the film, Bishop said, “I was little surprised in that the book is only talked about in the first half of the movie, but it’s an important message for a man’s lover and played repeatedly” on a telephone answering machine. He noted that near the end of the film the actual book appears to be returned to Robbins’ character, Joseph. Still, “I find it enthralling that someone picked that book from the Mosher collection to help define the character,” Bishop said. Joseph, though flawed by an affair with his friend’s wife, still comes across as a noble hero. He’s nearly killed trying to save that friend’s life in a fire on an oil rig, then helps heal the psyche of the war-scarred woman who nurses him back to health. The thrill of the hunt began in October of 2004, when Bishop received a telephone message asking his permission to use the Mosher edition of the book in a Eldesco Productions film being shot in Belfast and Madrid. Initially he suspected a fellow antiquarian bookseller or collector was having a little fun with him. But then he received a similar e-mail, responded, and learned director Isabel Coixet was sincere. He surmised she found him through Mosher-related Web sites. He explained she didn’t need his approval since no copyright was involved. Then it occurred to Bishop that this might be a terrific addition to his collection. Only trouble was Coixet herself wanted the book as a souvenir. Bishop, raiding his personal collection and using his contacts as a book dealer, was able to trade her two identical copies of the book, one for herself and the other for the producer, for the one he just had to have. Bishop now has all the trophies from the hunt tucked inside a protective case on his bookshelf. Don’t think that bookshelf is full. There’s always room for more, even after 22 years of collecting Mosher books. Bishop was working in administration at Millersville University in 1985, when he first wandered into The Book Haven, then located on North Prince Street, and discovered Mosher’s Old World Series of books. Mosher is known for combining discriminating taste in literature (many of his offerings were pirated from England, whose copyrights couldn’t be enforced here) with fine aesthetic sensibility. His books, with their fine bindings and illuminations, were relatively low-priced and accessible to the public, thanks to his avoidance of copyright expenses, Bishop explained. His interest in Mosher’s books and other fine and rare books eventually led him to take a job at The Book Haven and then to become a book dealer. Having learned much over the years about not just Mosher’s work but his Mosher’s personal relationship with books, Bishop recently embarked on research for a biography of Mosher, which he hopes to complete within several years. Jo-Ann Greene is editor of the Books section. Her email address is jgreene@lnpnews.com.